Will USDJPY Bounce to 108? Federal Reserve Chairman Jerome Powell’s testimony on the economy and monetary policy is the most important event risk this week. The Fed’s semi-annual report to Congress is always a key focus but this week’s speech carries even greater significance because it will be Powell’s first as the head of the most influential central bank in the world. Stocks traded sharply higher in anticipation of optimistic comments with the Dow Jones Industrial Average rising more than 350 points but currency traders aren’t as enthusiastic as they appear to be holding off buying USD/JPY until Powell speaks. There are 3 distinct ways that Powell’s speech could affect the dollar. The biggest impact on the FX market would be if Powell laid the groundwork for a March hike by specifying that rates need to increase quickly and could rise 3 to 4 times this year. With Fed Fund futures pricing in 100% chance of a hike next month, none of this would be new but given the dollar’s relatively weak performance in early 2018, unambiguously hawkish comments could drive the greenback sharply higher and take USD/JPY to 108. The dollar could also march higher if Powell highlights the improvements in the economy and the need for further rate hikes without specifying how many rounds although in this case, trading could be choppy and the dollar’s gains could be limited to USD/JPY. However if tone of Powell’s speech is cautious and he believes inflation or productivity is low, USD/JPY will drop to 106. Technically, USD/JPY is in a downtrend but it has also closed above the first standard deviation Bollinger Band. We believe that the pair will rally, finding its way back above 107 during the Asian and European trading sessions and possibly extending as high as 108 if Powell is hawkish. 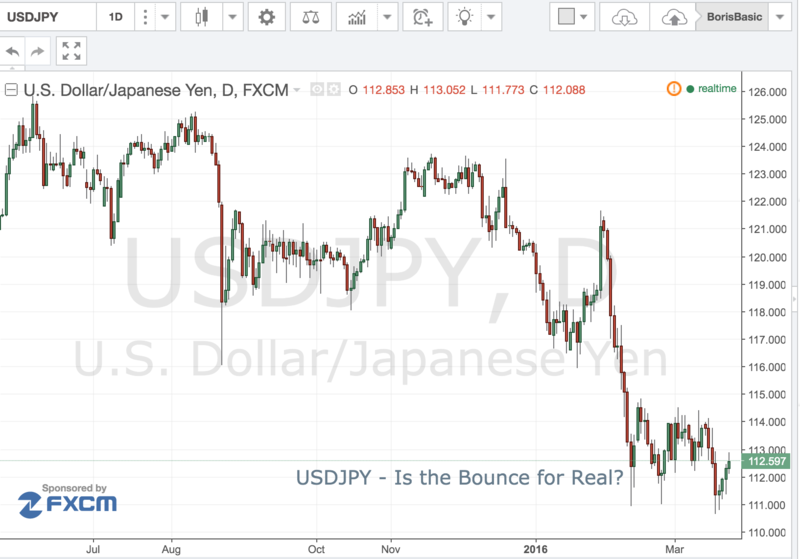 USD/JPY Is the Bounce for Real? This has been the third time that USD/JPY has tested the 111.00 figure and the third time that is has bounced off that level. Is three times the charm for the pair? It certainly appears that way as even the risk aversion flows from yesterday’s terrorist attacks could not drive it much lower. For the past week USD/JPY has suffered from the lingering aftereffects of the surprisingly dovish FOMC meeting last week. But last night Fed officials were considerably more hawkish suggesting that rate hike may happen as soon as April. The net result has been an improvement in US yields with 10 year benchmark rallying to 1.90% level. For now that area remains stiff resistance but if the 10 year can push towards the 2.00% mark then USD/JPY could move to 115.00 in the near future. In the meantime the market will get Durable Goods and Initial jobless claims tomorrow and if the data proves supportive it could help send the pair towards the 112.00 mark as the week comes to a close. 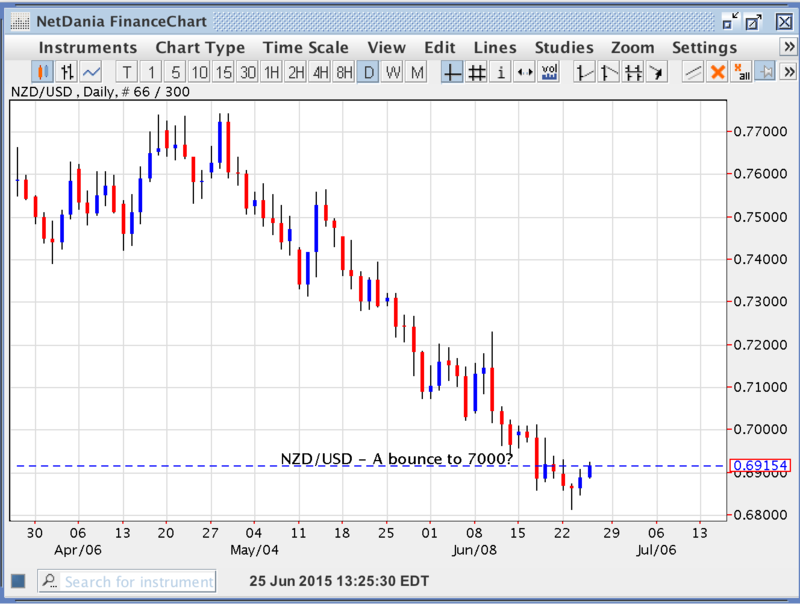 NZD/USD – A Bounce to 7000? 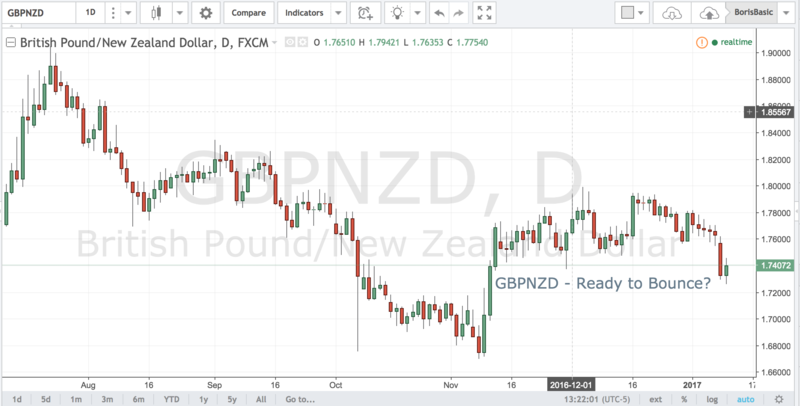 The kiwi has been under relentless selling pressure ever since the RBNZ changed its posture and decided to cut rates in order to lower the value of the currency. The RBNZ has been greatly concerned with with valuation of the dollar and its negative impact on the country’s Trade Deficit. New Zealand lives and dies by its food exports and the combination of stronger dollar and weaker demand from China has made growth a challenge over the past few quarters. However, after continuous selling the kiwi appears to have found some support over the past week ahead of the key 6800 figure. It even managed to stage 2 consecutive up days in more than a month. Today’s NZ Trade figures could determine if the move continues or if the kiwi once again heads to test the recent lows. The market is looking for a small deficit of -50M, but if the numbers surprise to the up side, the kiwi could climb towards 7000 over the next few days. After falling for 6 consecutive trading days and touching a low of 1.0520, euro has found a near term bottom versus the U.S. dollar. While we are long term bearish euros, we believe that the currency pair could bounce to at least 1.08 before reversing course and moving lower once again. The tone of today’s monetary policy press conference was decidedly more upbeat with ECB President Draghi saying that the recovery is broadening and strengthening. Earlier in the morning, the ECB left monetary policy unchanged and at the conference that followed Mario Draghi expressed his satisfaction with the smooth implementation of QE and the effectiveness of program thus far. He feels that improvements in the economy have diminished the economic risks and is moving the economy in the right direction. Draghi ruled a rate cut and instead said that the central bank can adjust QE if needed. European policymakers are happy with how Quantitative Easing is working and this optimism helped to stem the slide in EUR/USD and a further shot squeeze could drive the currency pair higher. 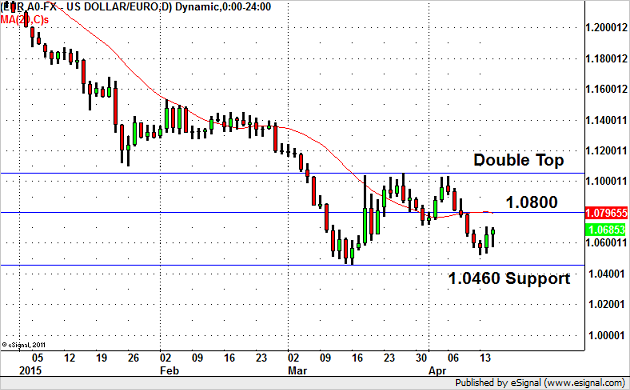 Technically, there is a clear double top in the EUR/USD that we expect to hold. However the target for the current rally is the 20-day SMA at 1.0800. If EUR/USD struggles to break this level and starts to move back down, 1.0500 and then 1.0460 will be targets to the downside. 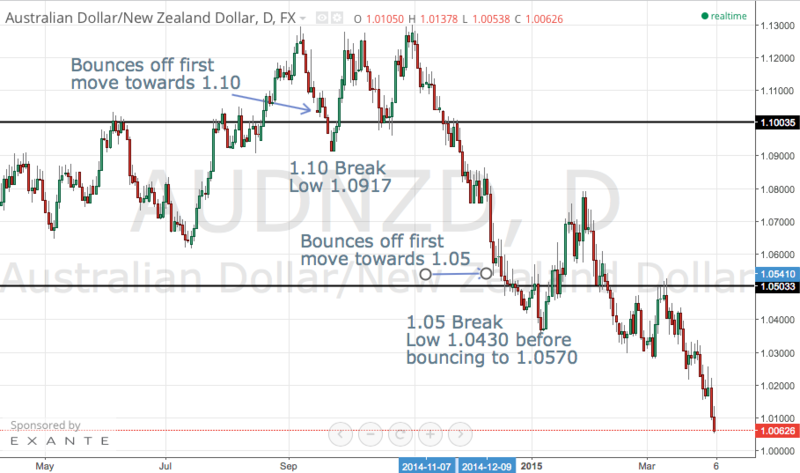 Will AUD/NZD Bounce Off Parity? Fundamentally, the slide in AUD/NZD has been driven primarily by AUD weakness. The currency has been hit hard by falling iron ore prices and weaker Chinese data. The Reserve Bank of Australia is scheduled to meet next week and many investors fear that the central bank will lower interest rates again. However, since they lowered interest rates in February, the Australian dollar has weakened against many major currencies, providing the RBA with some leeway if they choose to wait on cutting rates. It will be a close call because weaker manufacturing and trade activity has been offset by stronger service sector activity and healthier labor market conditions but if the RBA cuts rates in April they will either shift to neutral or signal a long pause before lowering rates again, minimizing the sell-off in the Australian dollar. The Australian dollar is also not far from their target rate of 75 cents and we believe they do not want to see AUD/NZD below parity. AUD/NZD is at a record so there is no support level until parity, which is psychologically and technically important. However the following chart shows how AUD/NZD bounced before and after testing 2 key levels that are not as significant as parity – 1.10 and 1.05. When AUD/NZD broke below 1.10 in September after spending some time above it, it dropped to 1.0917 before bottoming out and reversing sharply higher. In December when it broke 1.0500 it hit a low of 1.0430 before bouncing back above the 1.05 level to 1.0570. We are long at 1.0065 with another order to buy below parity at 0.9950. If AUD/NZD holds parity then great but if it breaks below parity our second entry should be triggered giving us a nice average price that would position us for a bounce back above this key level. EUR/GBP – Is the Bounce Over? The fierce rally in EUR/GBP has taken many traders by surprise. The EZ economy, plagued by political problems, deflation and QE has clearly been weaker than the UK economy whose growth was on par with US. However over the past several days the pair has done nothing but climb higher as a squeeze caught many late shorts scrambling to cover. Part of the reason for the rise has been the relative weakness in the pound as tepid inflation readings and weak wage growth have traders pushing rate hike expectations to 2016. Yet the BoE insists that the prospect of a rate hike is greater than that of a cut and the underlying UK economy continues to produce. This week the market is poised to see the Retail Sales data which is expected to rebound form a negative reading last month. 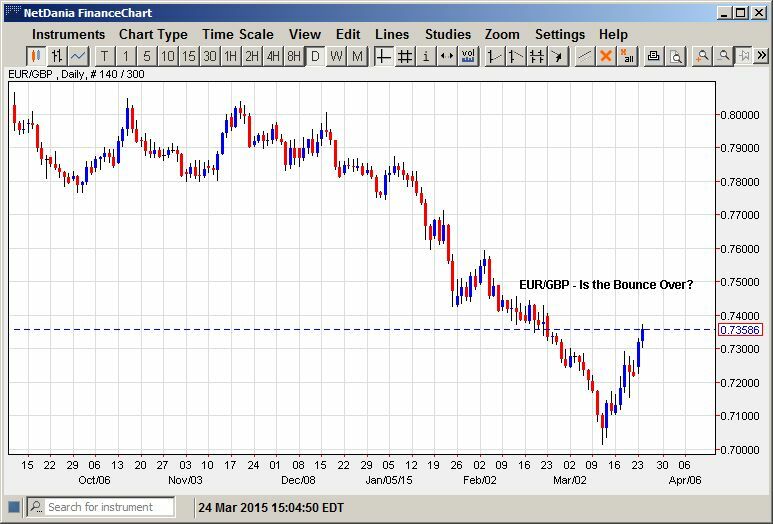 A positive bump in the consumer spending could reignite demand for cable and send EUR/GBP back to its recent lows. Having made a spike low at .7000 the pair has now bounced back to .7350 but it faces much tougher going above the .7400 figure where it has a shelf of resistance. A break above the .7400 would negate the bearish bias and suggest that a long term bottom has been put in. 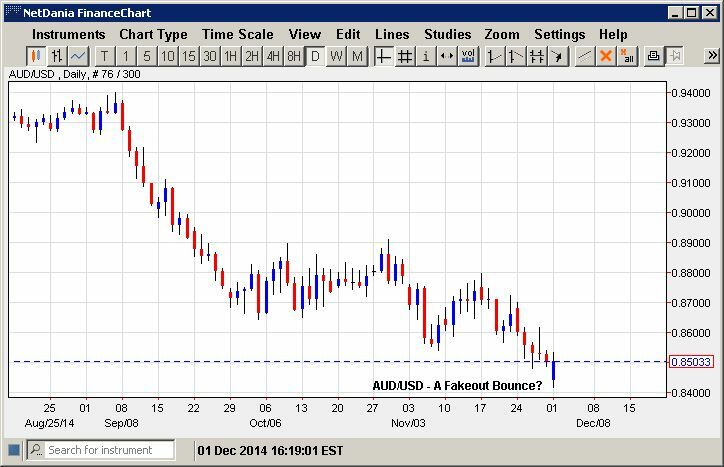 AUD/USD – A Fakeout Bounce? The Aussie staged a strong recovery off the recent multi year lows set over the holiday laden week and raced all the way towards 8500 before running out of gas. However, the sharp rebound may be nothing more that a short covering bounce as the fundamentals against the unit remains substantial. The recent drop in iron ore prices to below $60/ton is likely to have a massive negative impact on the AU economy which receives 1 out of 5 export dollars from that sector. If the slump in commodity prices does not correct soon, the RBA may be forced to consider another rate hike in order to ease the economic pain. Tonight’s meeting ma be key as the RBA could signal a change of posture from its current neutral stance that could bring another round of selling for the Aussie. Looking at the techs the 8400 level remains the key support and a break there could open a run towards 8250 over the next several sessions. Meanwhile only a break above 8650 alleviates the bearish bias in the pair.